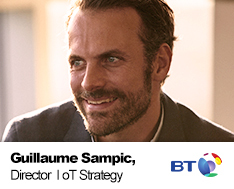 Guillaume Sampic is Director for Internet of Things Strategy at BT. Guillaume leads the definition and the execution of BT IoT strategy as part of our unit responsible for delivering solutions for BT internally and for BT customers globally. Prior to this, Guillaume was responsible for corporate strategy at EE, the mobile operator acquired by BT. Guillaume previous experiences include marketing strategy and management consulting with Accenture and high tech companies on three continents.